Although Month of Miracles has come to a close this year, we wanted to share one last story of a successful annual event that’s held in celebration. 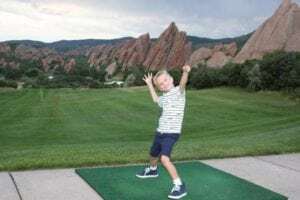 Kim Hawkins, vice president of RE/MAX Alliance, talks about her company’s golf tournament in greater Denver. And……just like that another RE/MAX Alliance Golf Tournament benefiting Children’s Miracle Network is in the books! We had a gorgeous day in a gorgeous setting, all for an amazing cause! We’ve been doing this tournament for 24 years now and it just seems to get better and better. Is it hard work? Well……the last few years it sometimes feels like it runs itself, but the days just prior and the “day of” is always a little chaotic and really, really long! And the wrap up is a lot of work. Is it worth it? Beyond all measure! This year our net total will be a little over $87,000 and with that we will surpass $1,000,000 since 2001 just from the tournament! It’s not really just a golf tournament – it’s offices and agents buying a golf ball number for $20 (almost 1000 sold this year) – it’s great auction items, silent and live – and so much more. The first question asked is typically, how have we grown it to this level? We’ve been incredibly blessed with continuity. In our committee members, our volunteers, our sponsors and our golfers. I read a great quote that says it perfectly: “Even a small dot can stop a big sentence. But a few more dots can give a continuity. Amazing but true. Every ending can be a new beginning.” (Rishika Jain). So….really…our goal to help the kiddos never ends. I looked at all of our faces at the tournament this year and realized how many we see year after year after year. That gives us continuity and makes it great! And the most important part of our continuity is our kiddos. We’ve always had the honor of hosting a number of our kiddos at the tournament. And what makes this so special to us all is seeing them grow up. Peyton Palermo joined us in 2010 as a Champion. She’s a wonderful grown up young lady headed to college now. And Carson Cline…..the little one who is full of energy and joy! And who is now running thanks to Children’s!! And sweet Joe….his first but not his last year with us…who had a blast with the golfers! These kids….and many more….are our (and MY) “why”! They have become part of the fabric of what makes this tournament so great, and THEY bring folks back year after year. We’re already planning next year (yes….it’s been one (1) week since our tournament and we’re ready for next year!). Knowing we are making a difference to these kiddos is OUR double rainbow! And we were gifted with that reminder at our dinner/auction this year! Can’t wait for number 25!!! Previous post: Remax's 1st Annual Balloon Event a Huge Success!